Looking for things to do this summer? Outdoor movies combine two things we love about L.A.: appreciation of movie-making and spending as much time as possible outside. 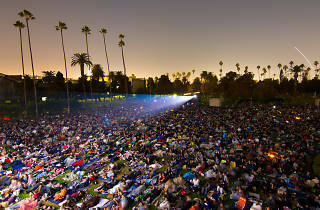 Summertime marks the start of limited-run, alfresco screenings across the city, be it atop rooftop bars, at L.A.’s best parks or even at a Hollywood cemetery. These outdoor venues draw moviegoers for a night under the stars, where you can bring out your picnic food, cozy up with a blanket and catch films both old and new. (If you’re looking for a fun date idea, this one takes the cake.) Be sure to check back all season long for updates on the list, as new screenings are always being added. Apr 1: Rooftop Cinema Club presents Get Out at NeueHouse Hollywood. Apr 1: Melrose Rooftop Theatre presents Bohemian Rhapsody at E.P. & L.P..
Apr 2: Rooftop Cinema Club presents Rebel Without a Cuase at NeueHouse Hollywood. Apr 2: Melrose Rooftop Theatre presents Pretty Woman at E.P. & L.P..
Apr 3: Rooftop Cinema Club presents E.T. The Extra-Terrestrial at LEVEL. Apr 3: Rooftop Cinema Club presents The Notebook at NeueHouse Hollywood. Apr 3: Melrose Rooftop Theatre presents The Greatest Showman at E.P. & L.P..
Apr 4: Rooftop Cinema Club presents 10 Things I Hate About You at NeueHouse Hollywood. Apr 4: Rooftop Cinema Club presents Interview with the Vampire at LEVEL. Apr 5: Rooftop Cinema Club presents A Star is Born at NeueHouse Hollywood. Apr 5: Rooftop Cinema Club presents Pretty Woman at LEVEL. Apr 6: Rooftop Cinema Club presents 10 Things I Hate About You at LEVEL. Apr 6: Rooftop Cinema Club presents Bohemian Rhapsody (Sing-along) at NeueHouse Hollywood. Apr 7: Rooftop Cinema Club presents Pretty Woman at NeueHouse Hollywood. Apr 8: Rooftop Cinema Club presents Pulp Fiction at NeueHouse Hollywood. Apr 8: Melrose Rooftop Theatre presents Crazy Rich Asians at E.P. & L.P..
Apr 9: Rooftop Cinema Club presents Clueless at NeueHouse Hollywood. Apr 9: Rooftop Cinema Club presents She’s All That at LEVEL. Apr 9: Melrose Rooftop Theatre presents The Big Lebowski at E.P. & L.P..
Apr 10: Rooftop Cinema Club presents Fight Club at LEVEL. Apr 10: Rooftop Cinema Club presents The Crow at NeueHouse Hollywood. Apr 10: Melrose Rooftop Theatre presents Thelma and Louise at E.P. & L.P..
Apr 11: Rooftop Cinema Club presents Get Out at LEVEL. Apr 11: Rooftop Cinema Club presents In the Mood for Love at NeueHouse Hollywood. Apr 12: Rooftop Cinema Club presents Bill & Ted’s Excellent Adventure at NeueHouse Hollywood. Apr 12: Rooftop Cinema Club presents Top Gun at LEVEL. Apr 13: Rooftop Cinema Club presents Bohemian Rhapsody (Sing-along) at LEVEL. Apr 15: Melrose Rooftop Theatre presents A Star is Born at E.P. & L.P..
Apr 16: Rooftop Cinema Club presents Pretty in Pink at LEVEL. Apr 16: Melrose Rooftop Theatre presents Wayne’s World at E.P. & L.P..
Apr 17: Rooftop Cinema Club presents Bridesmaids at LEVEL. Apr 17: Melrose Rooftop Theatre presents Creed 2 at E.P. & L.P..
Apr 18: Rooftop Cinema Club presents Magic Mike at LEVEL. Apr 19: Rooftop Cinema Club presents The Greatest Showman at LEVEL. Apr 20: Rooftop Cinema Club presents The Big Lebowski at LEVEL. Apr 22: Melrose Rooftop Theatre presents Pulp Fiction at E.P. & L.P..
Apr 23: Rooftop Cinema Club presents The Bodyguard at LEVEL. Apr 23: Melrose Rooftop Theatre presents Mean Girls at E.P. & L.P..
Apr 24: Rooftop Cinema Club presents Mean Girls at LEVEL. Apr 24: Melrose Rooftop Theatre presents BlacKkKlansman at E.P. & L.P..
Apr 25: Rooftop Cinema Club presents Léon: The Professional at LEVEL. Apr 26: Rooftop Cinema Club presents A Star is Born at LEVEL. 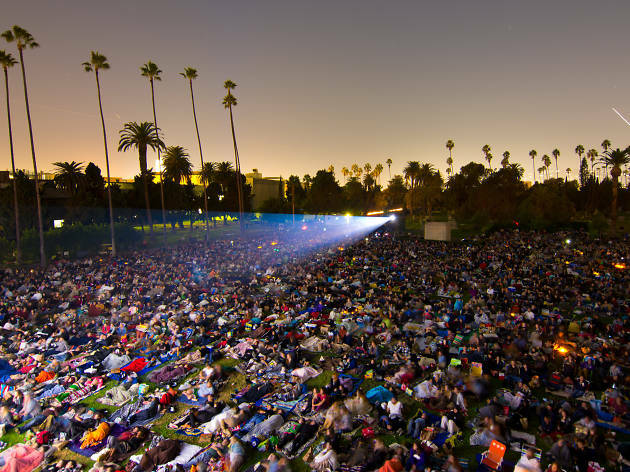 Apr 27: Street Food Cinema presents 500 Days of Summer at Los Angeles State Historic Park. Apr 27: Rooftop Cinema Club presents Crazy Rich Asians at LEVEL. Apr 27: Rooftop Cinema Club presents Love & Basketball at LEVEL. Apr 29: Melrose Rooftop Theatre presents Black Panther at E.P. & L.P..
Apr 30: Rooftop Cinema Club presents Dirty Dancing at LEVEL. Apr 30: Melrose Rooftop Theatre presents Zoolander at E.P. & L.P..
May 1: Melrose Rooftop Theatre presents Mary Poppins Returns at E.P. & L.P..
May 1: Rooftop Cinema Club presents Romeo + Juliet at LEVEL. May 2: Rooftop Cinema Club presents The Goonies at LEVEL. May 2: Rooftop Cinema Club presents Spider-Man: Into the Spider-Verse at NeueHouse Hollywood. May 3: Rooftop Cinema Club presents Pulp Fiction at LEVEL. May 3: Rooftop Cinema Club presents The Five Heartbeats at NeueHouse Hollywood. May 4: Eat|See|Hear presents Ferris Bueller’s Day Off at North Hollywood Recreation Center. May 4: Street Food Cinema presents A Star is Born at Poinsettia Recreation Center. May 4: Street Food Cinema presents Pulp Fiction at Los Angeles State Historic Park. May 4: Rooftop Cinema Club presents Bohemian Rhapsody (Sing-along) at LEVEL. May 4: Rooftop Cinema Club presents Aquaman at NeueHouse Hollywood. May 5: Rooftop Cinema Club presents La La Land at NeueHouse Hollywood. May 6: Melrose Rooftop Theatre presents Green Book at E.P. & L.P..
May 6: Rooftop Cinema Club presents Mary Poppins Returns at NeueHouse Hollywood. May 7: Melrose Rooftop Theatre presents 10 Things I Hate About You at E.P. & L.P..
May 7: Rooftop Cinema Club presents Clueless at LEVEL. May 7: Rooftop Cinema Club presents Dangerous Minds at NeueHouse Hollywood. May 8: Melrose Rooftop Theatre presents Back to the Future at E.P. & L.P..
May 8: Rooftop Cinema Club presents True Romance at LEVEL. May 8: Rooftop Cinema Club presents Bohemian Rhapsody (Sing-along) at NeueHouse Hollywood. May 9: Rooftop Cinema Club presents Casablanca at LEVEL. May 9: Rooftop Cinema Club presents The Breakfast Club at NeueHouse Hollywood. May 10: Rooftop Cinema Club presents The Breakfast Club at LEVEL. May 10: Rooftop Cinema Club presents Purple Rain at NeueHouse Hollywood. May 11: Cinespia presents Beetlejuice at Hollywood Forever Cemetery. May 11: Eat|See|Hear presents Crazy Rich Asians at Los Angeles State Historic Park. May 11: Street Food Cinema presents The Princess Bride at Griffith Park. May 11: Street Food Cinema presents The Royal Tenenbaums at Exposition Park. May 11: Rooftop Cinema Club presents Jawbreaker at LEVEL. May 11: Rooftop Cinema Club presents Don’t Tell Mom the Babysitter’s Dead at NeueHouse Hollywood. May 12: Rooftop Cinema Club presents Mamma Mia! at NeueHouse Hollywood. May 13: Melrose Rooftop Theatre presents The Notebook at E.P. & L.P..
May 14: Melrose Rooftop Theatre presents Aquaman at E.P. & L.P..
May 14: Rooftop Cinema Club presents A Star is Born at LEVEL. May 14: Rooftop Cinema Club presents A Star is Born at NeueHouse Hollywood. May 15: Melrose Rooftop Theatre presents Dirty Dancing at E.P. & L.P..
May 15: Rooftop Cinema Club presents Mary Poppins Returns at LEVEL. May 16: Rooftop Cinema Club presents Back to the Future at LEVEL. May 17: Rooftop Cinema Club presents The Matrix at LEVEL. May 18: Cinespia presents The Matrix at Hollywood Forever Cemetery. May 18: Eat|See|Hear presents Get Out at Santa Monica High School. May 18: Street Food Cinema presents Miss Congeniality at Glendale Central Park. May 18: Street Food Cinema presents The Wizard of Oz at Will Rogers State Historic Park. May 18: Rooftop Cinema Club presents Spider-Man: Into the Spider-Verse at LEVEL. May 19: Rooftop Cinema Club presents Top Gun at NeueHouse Hollywood. May 20: Melrose Rooftop Theatre presents Coming to America at E.P. & L.P..
May 20: Rooftop Cinema Club presents Back to the Future at NeueHouse Hollywood. May 21: Melrose Rooftop Theatre presents Clueless at E.P. & L.P..
May 21: Rooftop Cinema Club presents Who Framed Roger Rabbit at LEVEL. May 21: Rooftop Cinema Club presents Romeo + Juliet at NeueHouse Hollywood. May 22: Melrose Rooftop Theatre presents La La Land at E.P. & L.P..
May 22: Rooftop Cinema Club presents Bound at LEVEL. May 22: Rooftop Cinema Club presents Brokeback Mountain at NeueHouse Hollywood. May 23: Rooftop Cinema Club presents The Notebook at LEVEL. May 23: Rooftop Cinema Club presents Coming to America at NeueHouse Hollywood. May 24: Rooftop Cinema Club presents Coming to America at LEVEL. May 24: Rooftop Cinema Club presents Bohemian Rhapsody (Sing-along) at NeueHouse Hollywood. May 25: Cinespia presents Legally Blonde at Hollywood Forever Cemetery. May 25: Eat|See|Hear presents Coming to America at The Autry. May 25: Street Food Cinema presents Back to the Future at Victory Park Recreation Center. May 25: Rooftop Cinema Club presents Do the Right Thing at LEVEL. May 25: Rooftop Cinema Club presents Spice World at NeueHouse Hollywood. May 26: Cinespia presents Rear Window at Hollywood Forever Cemetery. May 26: Rooftop Cinema Club presents Ordinary People at NeueHouse Hollywood. May 27: Melrose Rooftop Theatre presents The Devil Wears Prada at E.P. & L.P..
May 28: Melrose Rooftop Theatre presents Top Gun at E.P. & L.P..
May 28: Rooftop Cinema Club presents Cruel Intentions at LEVEL. May 29: Melrose Rooftop Theatre presents Casablanca at E.P. & L.P..
May 29: Rooftop Cinema Club presents Aquaman at LEVEL. May 30: Rooftop Cinema Club presents Bohemian Rhapsody (Sing-along) at LEVEL. May 31: Rooftop Cinema Club presents A Star is Born at LEVEL. May 31: Rooftop Cinema Club presents Wayne’s World at NeueHouse Hollywood. June 1: Street Food Cinema presents Bohemian Rhapsody at Poinsettia Recreation Center. June 1: Street Food Cinema presents Crazy Rich Asians at Los Angeles County Arboretum. June 1: Eat|See|Hear presents Young Frankenstein at North Hollywood Recreation Center. June 8: Street Food Cinema presents The Goonies at Veterans Memorial Park. June 8: Street Food Cinema presents The Greatest Showman at Victory Park Recreation Center. June 8: Eat|See|Hear presents The Princess Bride at Pasadena City Hall. 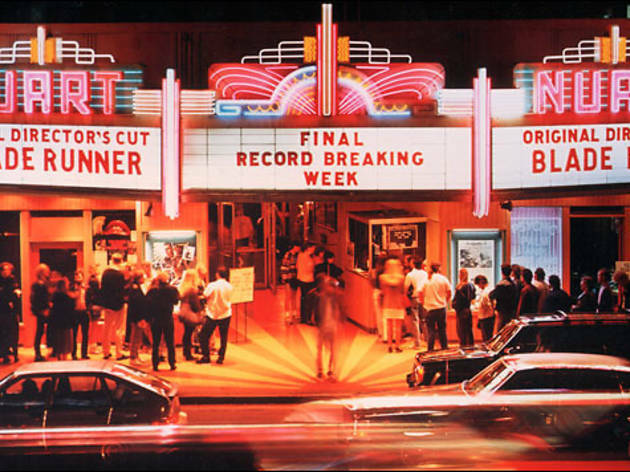 June 11: Poolside Cinema presents A Star is Born at Mr. C Beverly Hills. June 15: Street Food Cinema presents Shrek at Griffith Park. June 15: Street Food Cinema presents Step Brothers at Los Angeles State Historic Park. June 15: Eat|See|Hear presents Thelma and Louise at The Autry. June 18: Poolside Cinema presents Pulp Fiction at Mr. C Beverly Hills. June 22: Eat|See|Hear presents Fight Club at The Autry. June 22: Street Food Cinema presents Jurassic Park at Victory Park Recreation Center. June 22: Street Food Cinema presents Straight Outta Compton at Exposition Park. June 25: Poolside Cinema presents Mary Poppins Returns at Mr. C Beverly Hills. June 29: Street Food Cinema presents Clueless at Marriot Golf Course. June 29: Street Food Cinema presents Goodfellas at Exposition Park. June 29: Eat|See|Hear presents The Greatest Showman at Los Angeles State Historic Park. July 2: Poolside Cinema presents Bridesmaids at Mr. C Beverly Hills. July 6: Eat|See|Hear presents Beetlejuice at Santa Monica High School. July 6: Street Food Cinema presents Black Panther at Griffith Park. July 6: Street Food Cinema presents Jaws at Will Rogers State Historic Park. July 9: Poolside Cinema presents Alice in Wonderland at Mr. C Beverly Hills. July 13: Eat|See|Hear presents Casablanca at The Autry. July 13: Street Food Cinema presents Raiders of the Lost Ark at Victory Park Recreation Center. July 13: Street Food Cinema presents The Sandlot at Brand Park. July 16: Poolside Cinema presents Wildlife at Mr. C Beverly Hills. July 20: Street Food Cinema presents Anchorman at Veterans Memorial Park. July 20: Eat|See|Hear presents Romy and Michele’s High School Reunion at Los Angeles State Historic Park. July 20: Street Food Cinema presents Star Wars: The Force Awakens at Eagle Rock Recreation Center. July 23: Poolside Cinema presents Space Jam at Mr. C Beverly Hills. July 27: Street Food Cinema presents Crazy, Stupid, Love at Poinsettia Recreation Center. July 27: Street Food Cinema presents Guardians of the Galaxy at Victory Park Recreation Center. July 27: Eat|See|Hear presents Home Alone at Pasadena City Hall. July 27: Street Food Cinema presents Mean Girls at Will Rogers State Historic Park. July 30: Poolside Cinema presents Black Panther at Mr. C Beverly Hills. Aug 3: Street Food Cinema presents E.T. The Extra-Terrestrial at Verdugo Park. Aug 3: Eat|See|Hear presents North by Northwest at The Autry. Aug 3: Street Food Cinema presents The Breakfast Club at Veterans Memorial Park. Aug 6: Poolside Cinema presents Mean Girls at Mr. C Beverly Hills. Aug 10: Eat|See|Hear presents Fargo at The Autry. Aug 10: Street Food Cinema presents Monsters, Inc. at Griffith Park. Aug 10: Street Food Cinema presents Office Space at Eagle Rock Recreation Center. Aug 13: Poolside Cinema presents The Incredibles at Mr. C Beverly Hills. Aug 17: Street Food Cinema presents Bridesmaids at Will Rogers State Historic Park. Aug 17: Eat|See|Hear presents Mrs. Doubtfire at La Cienega Park. Aug 17: Street Food Cinema presents Pretty in Pink at Los Angeles County Arboretum. Aug 20: Poolside Cinema presents Avengers: Infinity War at Mr. C Beverly Hills. Aug 24: Eat|See|Hear presents Do the Right Thing at Santa Monica High School. Aug 24: Street Food Cinema presents Napoleon Dynamite at Brand Park. Aug 24: Street Food Cinema presents Say Anything at Pan Pacific Park. Aug 27: Poolside Cinema presents Thelma & Louise at Mr. C Beverly Hills. Aug 31: Street Food Cinema presents Mary Poppins at Victory Park Recreation Center. Aug 31: Eat|See|Hear presents The Shining at The Autry. Sept 7: Street Food Cinema presents 10 Things I Hate About You at Will Rogers State Historic Park. Sept 7: Street Food Cinema presents Dirty Dancing at Marriot Golf Course. Sept 7: Eat|See|Hear presents Say Anything at Pasadena City Hall. Sept 14: Street Food Cinema presents Fight Club at Los Angeles State Historic Park. Sept 14: Street Food Cinema presents The Little Mermaid at Griffith Park. Sept 14: Eat|See|Hear presents Willy Wonka and the Chocolate Factory at Pasadena City Hall. Sept 21: Street Food Cinema presents Selena at Victory Park Recreation Center. Sept 21: Street Food Cinema presents The Lost Boys at Pan Pacific Park. Sept 28: Street Food Cinema presents The Matrix at Los Angeles State Historic Park. Sept 28: Street Food Cinema presents Up at Glendale Central Park. Oct 5: Street Food Cinema presents Toy Story 2 + Toy Story 3 at Verdugo Park. Oct 12: Street Food Cinema presents Addams Family Values at Veterans Memorial Park. Oct 12: Street Food Cinema presents Beetlejuice at Will Rogers State Historic Park. Oct 19: Street Food Cinema presents Bram Stoker’s Dracula at Los Angeles State Historic Park. Oct 19: Street Food Cinema presents Hocus Pocus at Marriot Golf Course. Oct 19: Street Food Cinema presents Twilight at Victory Park Recreation Center. Can’t get enough movie screenings? If you’re looking for the best possible place to plant yourself for two hours of cinematic bliss, there are a few spots that rise above the rest. Whether you’re into arthouse, black-and-white, B-movie bonanzas or the most luxurious assigned-seating theater/cocktail lounge, this city has it all. 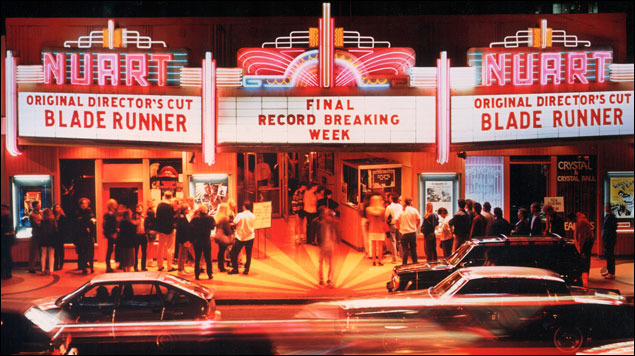 Here are our picks for the best movie theaters and classic cinemas L.A. has to offer.